LONDON (Hypebot) – Topspin, now owned by ArtistLink, has discontinued their merchandise integration with Spotify, leaving BandPage the only option that artists and labels have to sell merchandise on the popular music streamer. Once a leader in the direct to fan space, Topspin has steadily declined in popularity since new owners ArtistLink took over last summer. "As of today, any merchandise which was being distributed to Spotify artist pages via ArtistLink will no longer be displayed to users and artists will not be able to use ArtistLink to add new merchandise to Spotify. 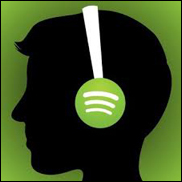 So if you had previously used ArtistLink to send merch to Spotify this will no longer work." That leaves BandPage, which has steadily been expanding their direct to fan offering, the only merch provider on Spotify. In addition to merchandise, the free BandPage integration includes VIP experiences and other D2F opportunities.